Leslie Model 101 | MOSweb Online! Special model made exclusively for use with some later revisions of Gulbransen consoles J, K, and N. Tibia channel switched between one 6×9 in the fast drum and a stationary 6×9. 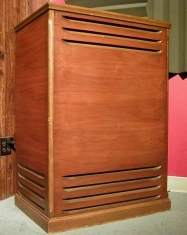 Isomonically separated complex channel switched between 2 additional 6×9 speakers in the fast drum, and two stationary 6x9s. –Special Thanks to Jimmy Williams for this information.